I still have a big silly smile on my face from a rerun of Road To Rupert, the frankly excellent episode of Family Guy that I saw again last night and which finally tuned me into the series when I first saw it some months ago. 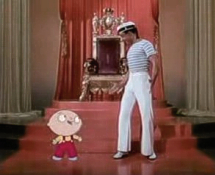 When Family Guy gets it right, it gets it really right, and the recreation of the animation and live-action Gene Kelly sequence from Anchors Aweigh, with baby Stewie replacing Jerry the mouse in the celebrated song and dance [right], is surely a series highlight. Big grins all around! While I’m off riffing, I’ll make a mention of Dr Horrible’s Sing-Along Blog finally coming to DVD in a couple of days, where it will be available exclusively from Amazon.com from December 19. For the uninitiated, Dr Horrible is a hysterically funny webisode series from Joss (Buffy) Whedon about a diabolically twisted super-villain…at least he kind of is in his own mind when he’s not whinging about being foiled or singing about the girl he secretly admires! I counted myself among the uninitiated until I saw the complete edition premiere at this year’s Comic-Con in San Diego, where the insane genius of the show was revealed to me and many others, including James, who was already a big fan. Completely brilliant in a Buffy: Once More With Feeling kind of way, you’ll find more on the project and the extensive list of DVD extras right here – who knows? If we buy big we might get the series all the fans want out of it! Right…back to business, and it’s DVD Tuesday folks. In true Disney follow-up tradition, new to stores today is a fresh Special Edition of The Little Mermaid II: Return To The Sea, one of the studio’s earliest direct-to-video sequels and one of the titles that earned these films the unfavorable “cheapquel” moniker. We’ll have a review up for the new edition – whose only bonus making this special is a previously unreleased deleted song – shortly, but in the meantime, we’ve a copy to give away to one winning name in our Little Mermaid II contest! We’ve gone Christmas Contest crazy: also up for grabs today is a copy of the Weinstein Company’s The Nutty Professor computer animated update. Nope, we hadn’t heard of it either, but as the 1960s original remains one of my favorite comedies I was intrigued enough to take a look…again our review will be up in the days to come. Can we expect great things? Well this is a Weinstein release (for all their great live-action pictures the guys just don’t get animation) and it seems it not only skipped theaters but almost went unnoticed on DVD (the disc has been out since November). However, for those like me that can’t resist, our Nutty Professor contest is now open! Both giveaways come to close this Sunday, 21 December at 11:59pm ET, so be quick to get your entries in, and remember that for our US readers, we still have our Tale Of Despereaux contest open until the same cut off point too. We’ll bring you the winning names for all three giveaways shortly after the deadline, and we’re also working on bringing you a heap of updates to keep you going over the Christmas break, including reviews of Watership Down: 30th Anniversary Deluxe Edition and Batman: The Complete Animated Series, plus a couple of really cool interviews and our regular look back on the Best Of The Year!